For other places with the same name, see Rouge River. The Rouge River is a river in Markham, Pickering, Richmond Hill and Toronto in the Greater Toronto Area of Ontario, Canada. The river flows from the Oak Ridges Moraine to Lake Ontario at the eastern border of Toronto, and is the location of Rouge Park, the only national park in Canada within a municipality. At its southern end, the Rouge River is the boundary between Toronto and southwestern Pickering in the Regional Municipality of Durham. The Rouge River is part of the Carolinian life zone that is found in Southern Ontario. After the eradication of both the Petun and the Wyandot (Huron), Senecas from New York attempted to establish/expand their fur trade activities by establishing a village named Gandechiagaiagon (recorded variously as "Gandatsekiagon", "Ganatsekwyagon", "Gandatchekiagon", or "Katabokokonk"), meaning "sand-cut" at the mouth of Rouge River. According to a 1796 list by English surveyor Augustus Jones, the Mississauga name for the river was Gichi-ziibiinh (recorded as "Che-sippi"), meaning "large creek." The river's name likely is French for "red river", based on the mappings by French explorer Louis Jolliet. In the former City of Scarborough, the Rouge was the "third rail" issue of municipal politics, and many minor candidates for mayor often ran on a platform to preserve it. However, since Scarborough was annexed into the City of Toronto, Toronto City Council has voted on occasion to allow development around the river. For much of the course of the system in Toronto is still parkland or farmland. As for the York Region sections, the southern watershed runs through residential areas and is lined with a few small parks. The source of the system is either natural or farmland. Currently, there is a degree of abandonment in the area, of former farmlands, and historic houses. There also remain many historic houses which are still lived in, some even farmed. Research on Toronto's website listing its holdings of historic properties reveals over 20 historic buildings in the area, including Hillside PS, Scarborough's first schoolhouse, which sits across the street from a house built by the Pearse family in 1855. The Rouge River begins in the Oak Ridges Moraine in Richmond Hill and flows past: Markham, northwest, central, to the south, including a couple of conservation areas, the eastern edge of Scarborough and Rouge Valley Park. The watershed of the Rouge River is located in the municipalities of Richmond Hill and Markham in the Regional Municipality of York; Pickering in the Regional Municipality of Durham; and Toronto. Lower course of the Rouge River, circa 1932. 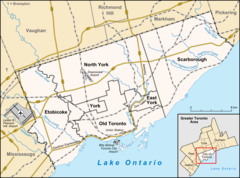 Tributaries of the Rouge River also extend into the municipalities of Aurora and Whitchurch-Stouffville in the Regional Municipality of York. The total area of the watershed is 336 square kilometres (130 sq mi), of which 40% is agricultural land, 35% urban, 24% forest/wetland/meadow and 1% watercourses/waterbodies. The headwaters of the Rouge River and its tributaries are found in the Oak Ridges Moraine. Water flows down from the elevated moraine to Lake Ontario. The Rouge River meets Lake Ontario at Rouge Beach. At Rouge Beach, the Rouge Marsh is to the north and Lake Ontario to the south. More than half the remaining wetlands in the Greater Toronto Area are located here in the southern Rouge River. It is one of a few wilderness areas left in South-Central Ontario and has been virtually untouched by development since the arrival of Europeans. While many exclusive homes and conclaves border this area on the southern tip, it is currently surrounded largely by agricultural land. It is even devoid of recreational development but sports a considerable network of walking or bicycle paths. Unlike other rivers in the Toronto area, it is allowed to fill its entire flood plain on a regular basis rather than being forced through an artificial channel. However, parts of its watershed include the Toronto Zoo and the Beare Road Landfill. Little Rouge River is a tributary of the Rouge, that runs northeast to Bloomington. View of Rouge Pond from Rouge National Urban Park. The pond is located at the mouth of the river. Rouge National Urban Park is a national urban park managed by Parks Canada. The Park the largest urban park in North America, comprising a significant portion of the Rouge River. The Park was created after the Ministry of Stephen Harper proposed, in the 41st Canadian Parliament throne speech, the creation of the national park. The Milne-Dam Conservation Park is one of several municipal parks that lie within the river's watershed. ^ "Rouge River". Geographical Names Data Base. Natural Resources Canada. Retrieved 2012-08-04. ^ Rouge River Watershed - General Map (PDF) (Map). Toronto and Region Conservation Authority. October 2006. Archived from the original (PDF) on October 3, 2012. Retrieved August 3, 2012. ^ Fairburn, M. Jane (2013). Along the Shore: Rediscovering Toronto's Waterfront Heritage. Toronto, Ontario, Canada: ECW Press. ISBN 9781770410992. ^ Boyle, David (1902). "On the paganism of the Iroquois of Ontario". Annual Archaeological Report 1901 - Appendix to the Report of the Minister of Education Ontario. Toronto: L.K. Cameron. p. 47. ^ "Rouge River Watershed Features". Toronto and Region Conservation Authority. Retrieved August 3, 2012. ^ "Rouge Valley to become national park". CBC.ca. June 3, 2011. Retrieved June 3, 2011. Wikimedia Commons has media related to Rouge Valley. Mandano Meriano, Hydrogeology of a complex glacial system, Rouge River-Highland Creek Watershed. Master of Science Thesis, University of Toronto, 1999. Toronto and Region Conservation Authority, Rouge River Watershed Plan, 2007.